Matt Meyer of Rhythm Revelations will present our Sunday service on February 17, and if his prior visits are any indication, it will be an uplifting and delightful experience. Matt has agreed to stay on at Albany UU that day to lead a workshop that will start at 1 PM. Here’s how Matt describes the workshop: Join us for an hour of community singing and world percussion. Drumming and singing are as ancient as our most sacred rituals and as grounding and joyful today as ever. Join us in exploring songs of justice and feeling the beat of drums from around the world. Bring your own drum if you have one; for those who don’t, enough will be provided. 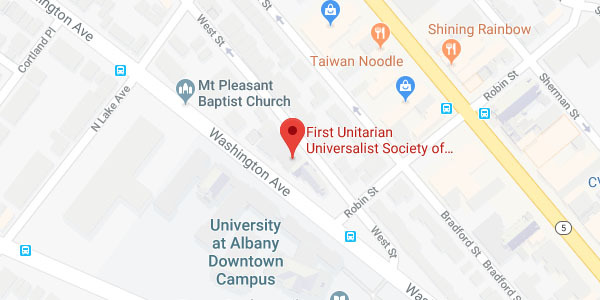 The workshop is open to all, but please tell us you’re coming at registration@albanyuu.org (or on the sign-up sheet in Channing) so that we know how many chairs to set up. A free will offering will be accepted. Please contact Dawn Dana at ddana1@nycap.rr.com with any questions.